I know it’s been a little over a week since my last post. I’ve been on the mend… Last Saturday after my last post here we went to visit some friends. While we were out to lunch with them I started to get a terrible headache that didn’t want to go away. By the time we returned home I noticed that a bite I had on my side had developed a bullseye mark around it. My husband said it was a sure sign of Lyme Disease. The joint pain and headache got worse and worse over the day on Sunday. By Monday morning I was at the doctor being diagnosed with Lyme disease and getting on antibiotics. I spent a lovely, not really, three days in bed…not able to do anything but sleep. After a week of treatment my pain is pretty much all gone and my energy is returning. I’m so happy that we caught it in time so that I will have no long term damage and that my body is responding well to the antibiotics! I’m also so glad to be able to get back to my work. It was awful not even being able to sit up and stitch for those few days! So I’m back in action stitching and getting projects finished again. I finished this little squirrel for a custom order yesterday. 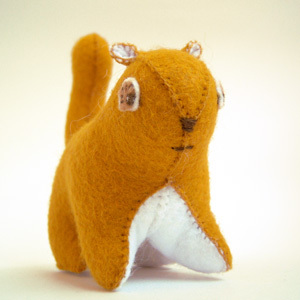 Later today I should have a new squirrel feltidermy finished for the shop. Tomorrow I should have unicorn feltidermy ready too! wow…glad you caught it in time! we’re oringinally from pennsylvania and know several folks who’ve been bitten by ticks, 2 of those ended up with lyme’s disease as well. thankfully they caught in early, as you did and no serious damage was done! hope you’re feeling 100% again! I’m glad you are back on the mend! Love the squirrel! Omigosh, that does not sound like something fun to catch. Glad you’re feeling better. Holy smokes…my sister in-law just found out a few weeks ago that she has lymes d. She has the bullseye on her stomache and is on a ton of antibiotics too. I am glad to hear you are feeling better and back to stitching! Oh, the good old Hudson Valley tick trap. Sorry to hear about the Lyme. I know 5 people who have it right now. I wish you a speedy recovery!!! yikes! i’m so glad you’re ok and feeling better. and still making way cute animals! Happy to hear you’re on the mend, and the squirrel is marvelous! oh i’m so sorry to hear that! the exact same thing happened to me about 10 years ago- as bad as it is, it is so much better to catch it early! i hope you’re back to 100% really soon. And that squirrel is, as ever, fantastic. Good lord! I’m so glad you’re on the mend and that you caught it so quickly!!! !